A bipartisan team of lawmakers is calling on President Donald Trump to immediately sanction Venezuela for its ongoing human rights violations and ties to terrorist organizations that reach the highest levels of government, according to a new congressional communication sent to the White House. Sen. Bob Menendez (D., N.J.) and Rep. Ileana Ros-Lehtinen (R., Fla.) petitioned the White House this week to take action against Venezuela and sanction leading government officials, including the country's second-in-command, Tareck El Aissami, who is believed to have ties to radical terror organizations. Venezuela has been devolving into further chaos in recent months as the oppressive socialist regime of Nicolas Maduro continues its crackdown on dissident voices and other reformists. Maduro caused an outrage in the United States earlier this year when he appointed former regional governor El Aissami to a high-level post that puts him next in line to assume control from Maduro. Aissami has long been accused of having ties to drug kingpins and radical terrorist organizations. Rogue nations such as Iran have made overtures to anti-Western nations such as Venezuela in an effort to boost the number of rogue nations thriving in America's backyard. Numerous experts have claimed Hezbollah, an Iranian proxy group, and other terrorist forces have been spotted moving across Latin America. The call for sanctions by these lawmakers comes as the Trump administration considers ratcheting up international pressure on a range of bad actors, including Iran, North Korea, and others. Many GOP leaders in Congress have been urging the White House to be more aggressive when it comes to dealing with rogue nations across the globe. "We are writing to request that your administration take immediate action to sanction regime officials responsible for the ongoing dire humanitarian situation, oppressive human rights conditions, and unconscionable corruption taking place in Venezuela," write Menendez and Ros-Lehtinen, according to a copy of the letter obtained by the Washington Free Beacon. "Moreover, Maduro’s recent appointment of Tareck El Aissami puts him next in line to possibly become the next leader of Venezuela, which is extremely troubling given his alleged ties to drug trafficking and terrorist organizations," the lawmakers write. "It is extremely concerning that the Maduro regime continues to undertake increasingly authoritative measures against innocent people in Venezuela," according to the letter, which accuses the Venezuelan leader of committing mass human rights atrocities in an effort to retain power. "The opposition has been subjected to intense persecution, being vilified on state media by Maduro regime officials, routinely accused of false crimes, and arbitrarily imprisoned," the lawmakers write, adding that there are more than 100 political prisoners, including U.S. citizens, being held captive in the country. "We believe that all of them must be freed," the lawmakers write. 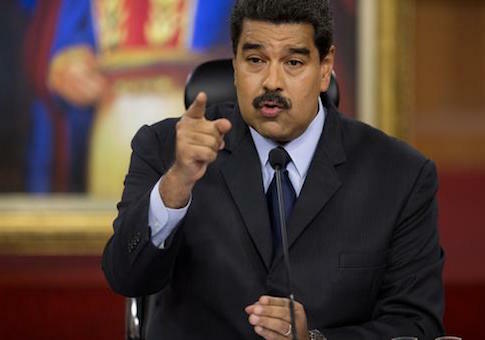 "Maduro has also relied on corrupted branches of his regime, such as the Supreme Court and the National Electoral Council, to invalidate actions undertaken by the National Assembly, including an amnesty bill for the country’s political prisoners and a motion for a constitutionally enshrined recall referendum on the presidency." The United States must take aggressive action against Venezuela in order to further isolate Maduro's government and spark regime change, according to Menendez and Ros-Lehtinen. U.S. business interests also are at stake, according to the lawmakers, who make the case that corruption in Venezuela is harming American interests. Many companies, they say, have been forced to pay millions in bribes to Venezuelan officials in order to complete business transactions in the country. "We are concerned that over payments of food contracts could likewise represent a potential liability for U.S. companies," according to the letter. "Thus, we believe that the Office of Foreign Assets Control [OFAC] should issue clarifying regulations to ensure that U.S. companies do not inadvertently engage in business directly with any corrupt regime entity in Venezuela that would violate the Foreign Corrupt Practices Act of 1977." The appointment of El Aissami is particularly concerning to Menendez, Ros-Lehtinen, and others in Congress. El Aissami has been suspected of issuing passports to members of the Hamas and Hezbollah terror groups during his tenure overseeing the country's immigration bureau. El Aissami also has been alleged to have played a role in the recruitment of radicalized individuals to Hezbollah. "The nexus between corruption, drug trafficking, and the influence of extremist terrorist organizations in Venezuela is well documented, many of these nefarious and illicit activities are associated with El Aissami," the lawmakers write. This entry was posted in National Security and tagged Bob Menendez, Hezbollah, Ileana Ros-Lehtinen, Iran, Venezuela. Bookmark the permalink.